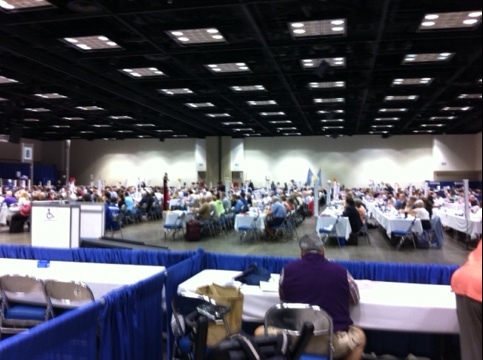 This is the House of Deputies of the General Convention of The Episcopal Church at work yesterday. My understanding of how all this works is very limited. But there are nearly 1000 people taking part in this meeting. When I was there, they were voting on the ‘amendment to the amendment’. Fascinating for those who like that kind of thing – but I went off next door to the House of Bishops where I was ‘recognised’ with other visiting bishops. I have quite a few friends there – mainly from my involvement in their College for Bishops training programme. The content of resolutions is not agreed before they get here – rather that is determined by a series of hearings at which anybody can speak. I hope to do that today.